From his workshop on South Portland’s industrial waterfront, Lutjens is building a following among a growing number of small-batch wine and spirit makers who value the flavor his barrels impart, fielding requests from as far away as Europe. 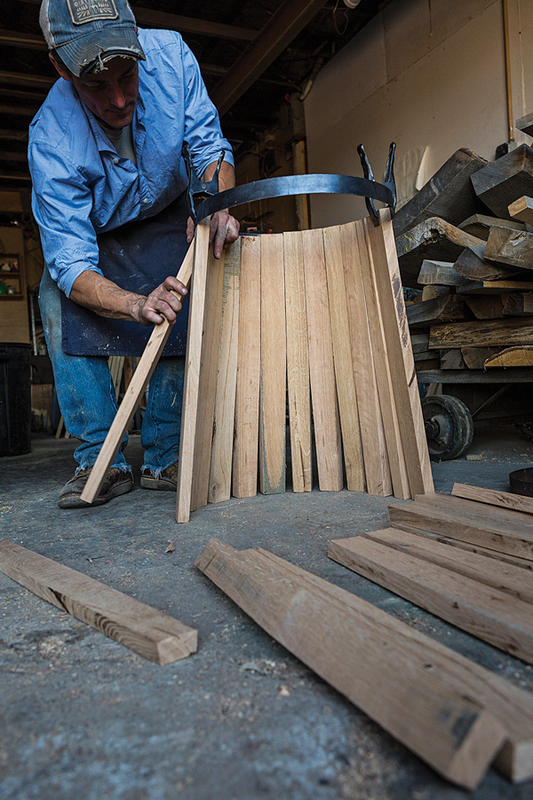 His clients are clamoring for staved aging vessels made from Maine white oak, which Lutjens calls “singular in its bouquet of flavors” thanks in part to the state’s cold climate, which slows the trees’ growth, ups their sugar content, and gives the wood a tighter grain. 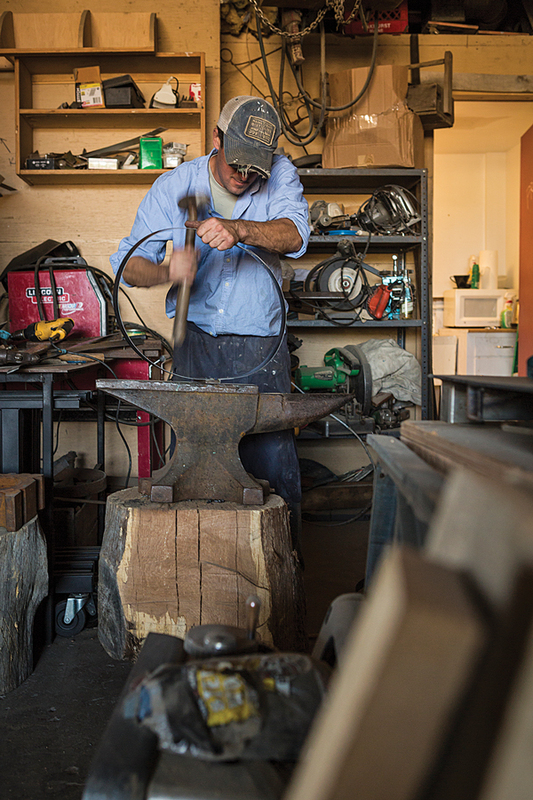 Lutjens brings nearly three decades of blacksmithing, woodworking, and metalworking experience to bear shaping staves and hoops for his casks. 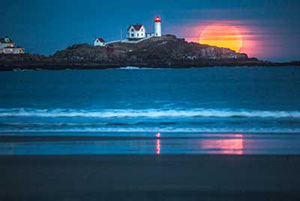 His clients include artisan hooch merchants like Maine Craft Distilling, New England Distilling, Bluet Winery, and Short Path Distillery in Massachusetts. And so: patience. 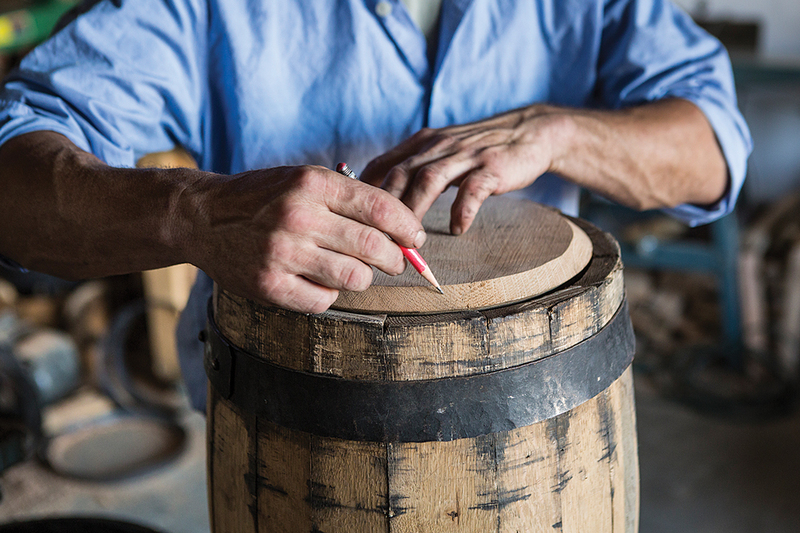 Lutjens puts in a full day to make a single specialty barrel for his distillery customers. 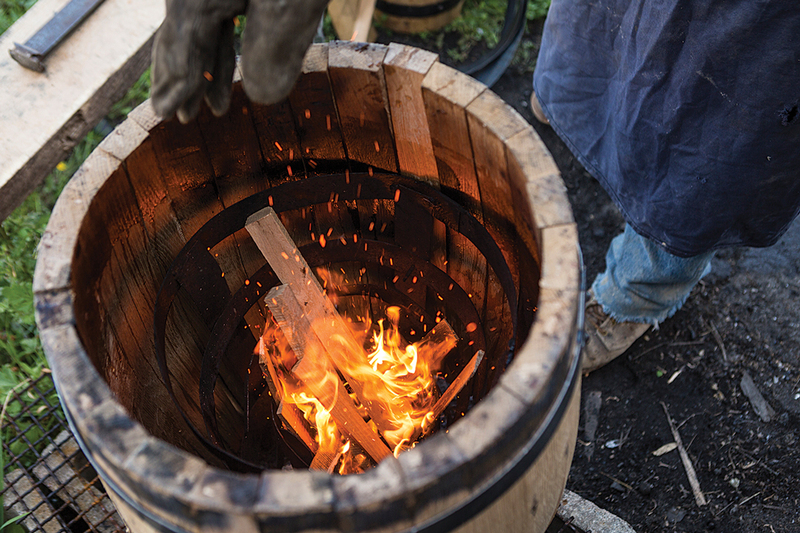 Even after hours spent sculpting, steaming, and shaping wood and steel into a watertight cask, he isn’t finished; the final step is to set it on fire. 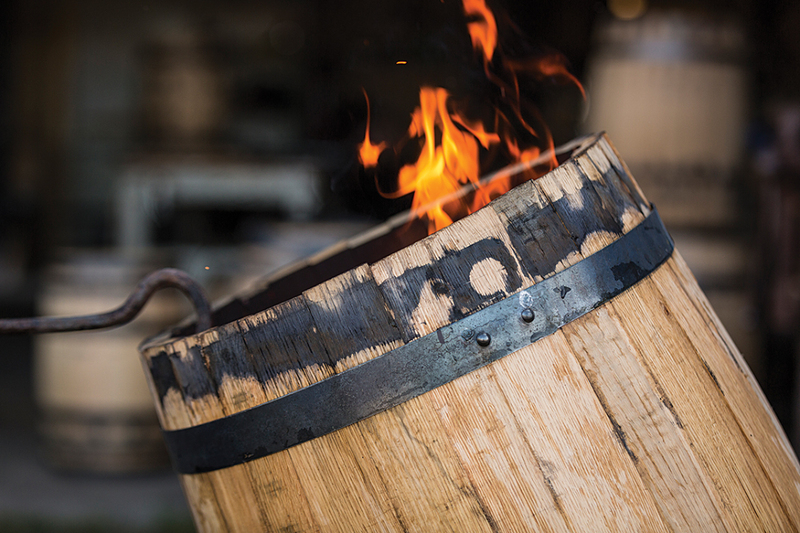 Or so it looks, anyway, when he lights a blaze in a metal basket inside of a barrel, charring the wood to caramelize sugars inside, which will give its liquid contents the smoky, sweet flavors that bourbon makers (and drinkers) crave. Even then, Lutjens has to wait to learn how things turned out. 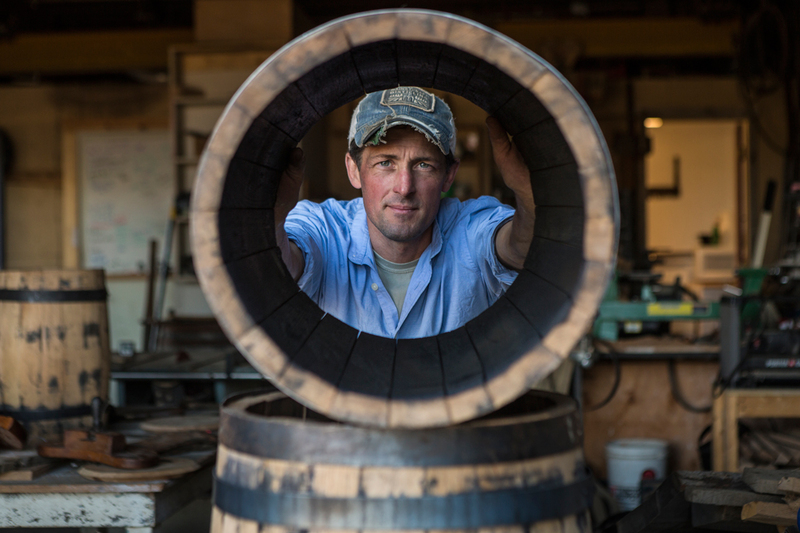 He’s been making tight-cooperage barrels in Maine for nearly five years, and some of his past customers are only now, after years of aging product, getting to taste the fruits of his labors. 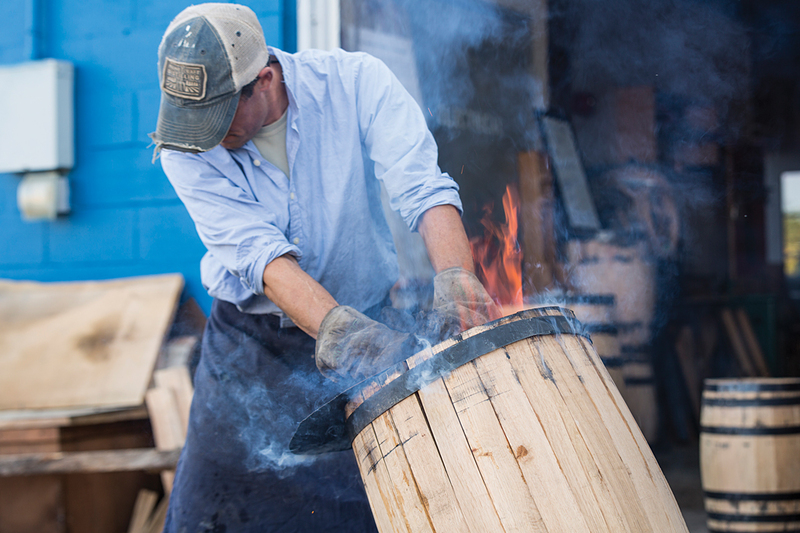 Even after hours spent sculpting, steaming, and shaping wood and steel into a watertight cask, he isn’t finished; the final step is to set it on fire. Fortunately for Lutjens, he’s the only cask crafter north of New York State, and his potential customer base is expanding rapidly.  Some 10 new distilleries have opened in Maine alone in the past five years. Most are boutique operations, producing fewer than 500,000 gallons annually. At 45, Lutjens is wiry, agile, and soft-spoken. When he’s working, he covers his jeans and flannel with a big leather apron. He was raised in Winter Harbor and started working with his hands in his teens after he was introduced to blacksmithing. That experience, along with stints in construction, metal fabrication, and woodworking, all feed into his craft. 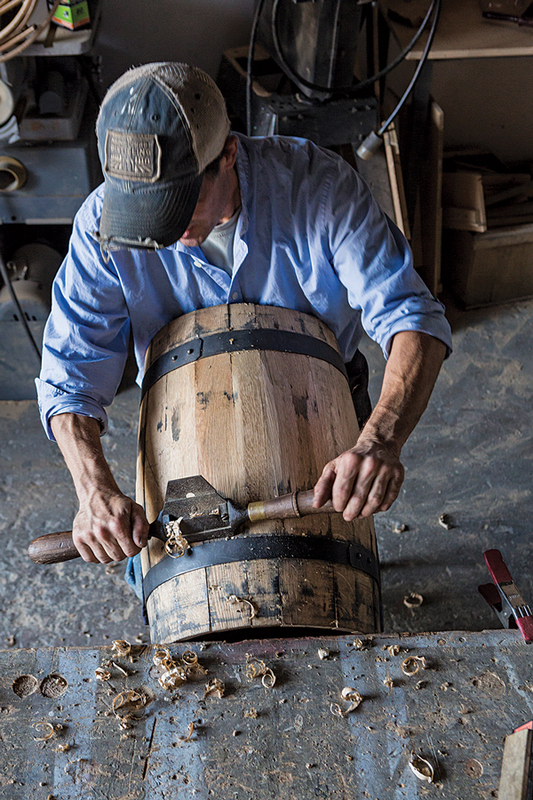 He once spent a month learning from coopers at one of Kentucky’s larger barrel makers, but for the most part, he’s self-taught. Coopering piqued his interest, he says, in part because the ultimate focus is on quality rather than cost. Sourcing wood was a challenge at first. A $25,000 loan from a community development nonprofit bought him his first large stockpile, and he’s since slowly built relationships with Maine loggers. Getting wood milled to his specifications can be challenging. 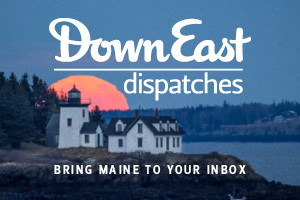 Most of Maine’s sawmills, Lutjens says, have long been focused on the pulp and paper industry, and they’re unaccustomed to making the type of cuts that allow for a watertight barrel. He works with a pair of mills in Limington and Acton and bought his own small sawmill to do some work himself. Lutjens expects he’ll turn out some 170 barrels in 2017, up from fewer than 60 the year before. A 10-gallon barrel made from wood seasoned for a year runs $200 (Lutjens makes everything from 2½-gallon buckets to 53-gallon giants). For now, he works solo, using many traditional hand tools. And while he’s passionate about the history of the craft, he’s also eager to scale up. He recently got a call from a potential customer in Hungary (“American-style” white-oak barrels are increasingly popular abroad) who wanted to order 1,000 barrels. Volume like that would require big investments in machinery and staff, and right now, Lutjens can only afford to grow in increments. But he’s stockpiling wood and hopes to hit 500 barrels next year. In the meantime: patience. And hard work. 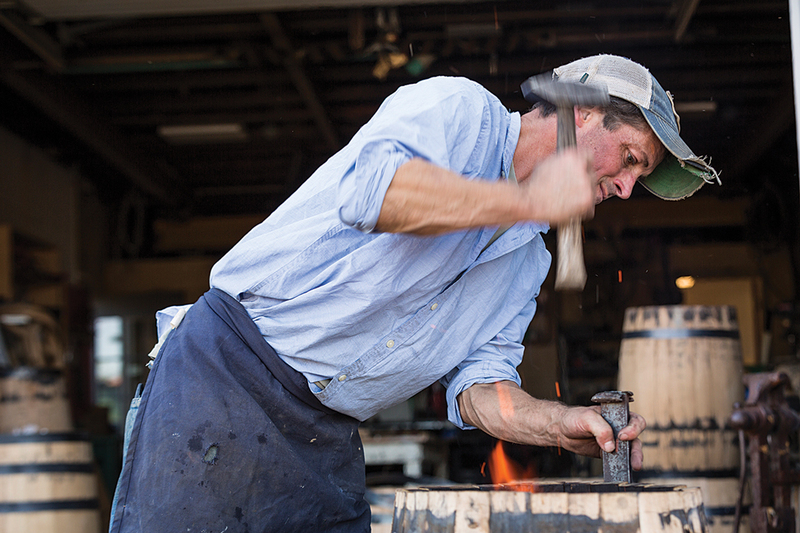 Lutjens still moves around all his wood and barrels by himself, which takes plenty of elbow grease. His 53-gallon barrels are big enough to double as pub tables. 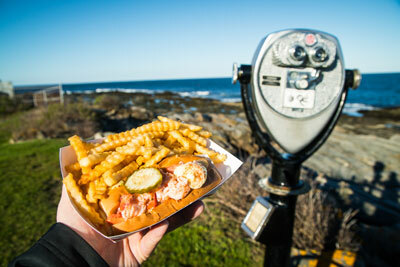 See more “Making It In Maine” stories!